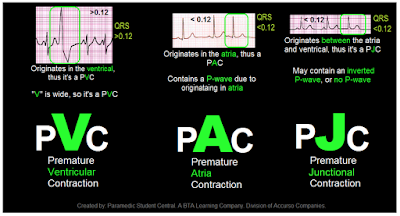 I've been assisting with a paramedic class recently, and it has been brought to my attention, that a lot of students still don't fully understand the difference between the PVC, PAC, and PJC. So, in explaining to them about each, I have created this quick reference tool. I hope that this quick reference tool will help everyone out. You can also visit one of my older posts about PVC, PAC and PJC's. Click here.